Absolutely amazing!!!! My chicken breasts were a little thick before halving them so I amped it up to 12 minutes and 3 minutes on 2nd part. I have one of the CooksEssential brand air fryer and I was thrilled with my first time cooking chicken in it.To answer an earlier question, I just scooped then out with a heavy duty spatula (Turner). Oh my yummy!!! Tweaked a bit by spraying the cutlets with olive oil and then shaking them in a bag with the crumbs and cheese. Came out awesome. Perfect dinner for two with a little left for lunch tomorrow. I am a terrible cook, with inept kitchen skills. I love chicken parm, so tried the recipe. It was easy, even for me, and it was DELICIOUS!! Thanks so much for this awesome recipe. I will definitely be making this again. I just made this tonight for my fiancé and I. He loved it. I was thanked like five times for this meal. I followed the recipe and it came out perfectly. Thank you! Very easy and quick to make. Chicken was very tender and had a good flavor. This recipe came out exACTLY as you described and pictured. Your cookbooks were my 3 favorite Christmas presents and got me on track for a great and healthy 2019! Fabulous! This was my first successful dinner meal recipe in an air fryer, and it was enjoyed by every member of the family! So so delicious!!! Please keep posting more healthy recipes like this…..healthy food is inspiring even our son! Very good and easy. Will definitely make again! Thanks for sharing!! Made this for dinner and it was delish!! I thought the same thing! Jeesh people. ???? Made this several times. Fantastic!! This is so easy and delicious. I have always worried about chicken, which I love, as over cooked it becomes dry. This was crunchy on the outside but moist on the inside. Love the recipe and love my air fryer. 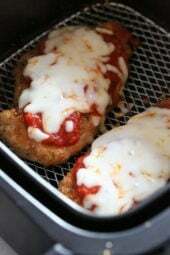 I just purchased my air fryer and decided to try your chicken parmigiana recipe. My husband says he’s never going back to Olive Garden!? Do you do 6 mins each side? I think it depends on the air fryer. I did 6 on one side and 4 on the other. I also kept it warm 2 minutes while I finished the rest of the sides. My husband and I made this tonight! We really enjoyed the flavor. Next time I do plan on seasoning the chicken before the bread crumbs, but other than that, this is becoming a staple in our home. Cara-try spraying the the chicken with oil right before you cook it. I’ve made that mistake before. My husband really liked this, but like some others, I also had trouble with it not being cooked through. Not your fault — I suspect the problem is that I had thick chicken breasts, so when I sliced them through lengthwise, they were thicker than yours were. Maybe it would be worthwhile to guess how thick yours are, and put that number in so that people can know they should pound theirs down a bit if they’re thicker? Are you clicking the print button first? It should let you copy and paste from there. Would it be more points conscious to use eggs instead of butter because eggs are now 0 points? Thank you for your recipe. My husband is the pickest eater you will meet and this he enjoyed. I recently joined ww and this is a great recipe to keep me on track. This you for sharing. I used light butter and sauce that was only 2pts so I my have lesser pts than 4pts, but I will still use 4pts to be safe. Delicious and so quick to make!!! I have a Breville air fryer and put all 4 pieces in. Mine says to not use the basket with things that drip so I used a tray in the basket. My chicken was undercooked. Do you think it’s because of the tray or maybe my chicken was too thick? Perhaps both? I would add more time for sure. Comments are annoying and embarrassing. “It was way undercooked any suggestions?” Yeah, cook it longer. Easy and delicious. One of my husband’s favorite meals. I just made this for dinner and it is GREAT!! The chicken is just right not under-cooked not over-cooked and the breadcrumbs are crispy and everything is just awesome!! Will DEFINITELY make this again! My basket was small so it took about 30 minutes to make 6 pieces but boy oh boy am I glade I did!! hi gina, we didnt pre-heat our air fryer…they came out under cooked. is it 100% needed to pre-heat the air fryer? I will never, ever, EVER cook chicken parm the way I used to now that I’ve found this recipe. It is seriously so crisp and delicious and I think I used to drown mine in sauce and cheese – and it just doesn’t need it. The flavors are amazing; simple is better. We LOVE this recipe!!! I just made these this evening! They were amazing! I used my Air Fryer and I pre-heated the unit as instructed. I used chicken tenderloins instead of breasts because that is what I had on hand! They were most and flavorfully. I served with zucchini pasta. Definitely making these again and again! I have loved every recipe I have made from Gina….thank you for creating such tasty and healthy recipes. Making this for dinner tonight with some garlic bread and asparagus!!!!!! I love my air fryer and I’m so happy your putting out some tried and true recipes for it!!!!!!!! Thank you again! The basket comes out drew. Also, I use my Misto and fill it olive oil. Hi I followed instructions but my chicken was still a little pink. Any suggestions ? I am not sure if all brands cook the same, or if your breasts were thicker. I would add a few more minutes. Wow, what a delicious recipe! From smelling my house so deliciously to the fabulous taste, a WINNER!My husband already requested it for next wee! Is this recipe updated for the WW Freestyle plan? This recipe was absolutely delicious!! I just got my air fryer for Christmas and this is one of the first things I have tried. Not only was it easy but a recipe I am sure I will go back to many times. I served it to my husband and son and they both loved it. I had no left overs so now I need to find another Skinny taste recipe for dinner tonight. Hi. Are the new flex points the 4 you show or the 6? Thank you. My whole family gobbled it up – it was easy and soooo good! Go by the smart points, they have been updated to reflect the freestyle program. This is the very first thing we made in our new air fryer and it turned out great. I cooked them for one minute longer than noted in the recipe and could have given it two minutes more after putting on the sauce and cheese. We will definitely make this again. I wish there was a cooking demo video. Not sure how you halve the chicken breast; split to make it thinner or just cut across the middle? Lengthwise to make it thinner. Yummy! Made tonight and we all enjoyed! I didn’t have seasoned bread crumbs so I added Italian seasoning, few shakes of garlic powder and one shake of onion salt. I had Olive Oil Pam and sprayed top of chicken with that. Will definitely be making this again and again! I’m guessing you used chicken cutlets, but you didn’t say. Skinless or skin on? Looks great. What air fryer would u recommended? Thank you! 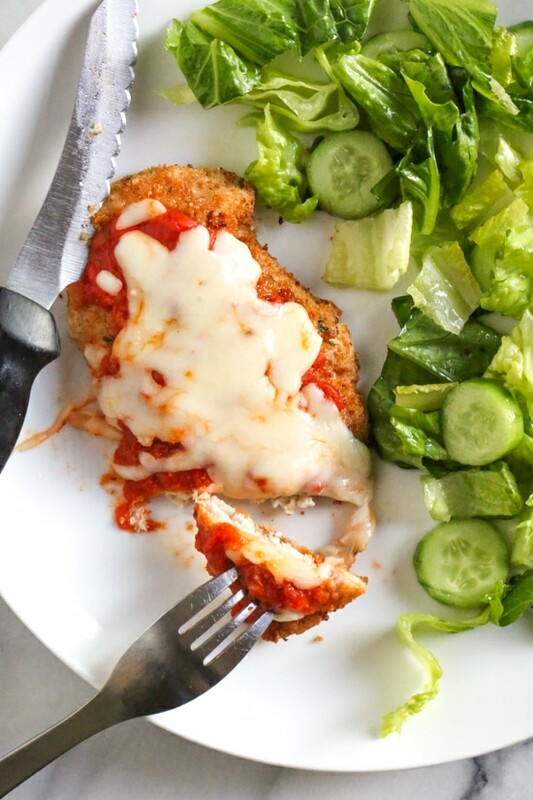 I love chicken parm, but my daughter is allergic to gluten so this is great! Thanks! Made this tonight with my Airfryer XL. Yum! Thanks for the quick, easy, delicious recipe! 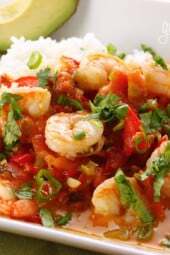 I love your site and have made so many of your delicious recipes. When you started talking about a air fryer I just had to get one. It arrived yesterday. We ordered the power air fryer oven, then one on the infomercials. I’m so excited to print your recipes and try them. This one comes with trays and a rotisserie turner. Your excitement for them was so contagious!! Thank you!!! Great! Hope you enjoy the recipes! I’m thinking about buying an airfryer. I notice a couple people mention about their nuwave. Does it matter what brand to buy or is nuwave the best option for airfryer? Hi Gina, I made this for the second time tonight and I love the recipe except that my chicken has come out undercooked. I followed the recipe exactly. Do you think the breasts were too thick? Too cold when I put them in? Just curious for your thoughts. Thank you! yes, did you cut them in half? Can foil be used.? Also I use a lot of parchment paper for baking. Can this be used? Sams’s warehouse sells a honey and garlic rub. Did drumsticks with it. No oil. They came out with a crunchy outer skin and very succulent. I bet your parmasain recipe would come out fantastic with this rub mixed into some gluten free Italian breadcrumbs available at my local grocery. Make up some Texas toast for chicken parm sandwiches. How can I figure out the Points Plus value? My husband made this tonight and followed the directions to the tee. When I bit into my piece, the chicken was grossly undercooked. I then checked the internal temp with an instant food thermometer and the temp was only 118 degrees. Chicken needs to be 165. Quite a food safety hazard. I would recommend checking the internal temp of the chicken and I would suggest you add that to the written recipe. When fully cooked it was delicious. That should be a given to always check IT when cooking anything. Shouldn’t be required to be in a recipes directions. I love this recipe, delicious!! It’s just hard to convert all ingredients to European grams etc, but it’s definately worth the time! This looks Ah-mazing! This is my favorite dish and this inspired me to buy an air fryer! Thank you!!! Can’t wait to try it! Can you make a recipe for fish? What type of air fryer? It came out perfect…. 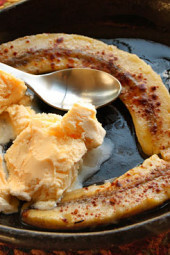 very simple recipe and it looked and tasted very good! Can I put foil in the fryer basket? Will chicken still be crispy? I USE PERFORATED PARCHMENT CIRCULAR LINERS ORIGINALLY MEANT FOR BAMBOO STEAMER BASKETS. THESE CAN BE FOUND READILY ON AMAZON. AFTER PREHEATING THE AIR FRYER, INSERT LINER AND FOOD. CLEANING OF THE BASKET IS ALSO EASIER WITH THEIR USE. Wow! This looks great and I like the sound of dinner cooked in less than 20 minutes! I make the Costco salmon patties in mine all the time, but would love to see one of your delicious recipes for it. Also, next up will be your cauliflower fritters, lightly sprayed with olive oil! Thanks for trying this stuff out for us! NuWave 36001 Brio Air Fryer. Tried the pink chops last night. They were pretty thick so it took a little more cooking time. They were tender snd delicious! Trying the chicken parm tonight. Would a convection toaster oven work the same as air fryer? That’s a great question, I guess if you have a mesh or wire rack the answer should be yes! Which brand do you have? Gina. . Update. Made it for lunch in the convection oven and it was great!! Followed recipe to the letter. Thanks once again. Looking for a 6 qt. air fryer. Which one do you recommend? Thanks!! I have a 3 qt, I am buying the Nuwave 6 qt today to see if I like it better. What brand is your 3 quart? What is the sat fat in this recipe? To correctly calculate the Smart Points the saturated fat grams are necessary. You do not show 0 g for sat fat (as you do in some other recipes) but there are several types of cheese & oil in the recipe. It looks like it was missed. If there is indeed 0 g sat fat per serving, it would be helpful if you showed 0 g sat fat. As it is now, I need to put the whole recipe through WW Recipe Builder to verify the Smart Points value. The only accurate way to determine any recipe’s SmartPoints® value is to plug the ingredients into the recipe builder on the Weight Watchers website which is how I calculate everything. The SmartPoints® calculator isn’t meant for recipes and will often give you the wrong points (usually higher) because it’s counting the fruits and vegetables. So if you see a recipe with a SmartPoints® value that’s different from what the calculator tells you, that is why. Just want to say I enjoy all of your recipes. Keep posting Air Fryer recipes. What brand of Air Fryer do you have? So many on the market no. I LOVE that you’re posting healthy air fryer recipes!! Keep up the good work!! Hi Gina! I’m curious about your side salad. It looks like romaine and cucumbers — do you put any dressing on it or toss it with anything else? 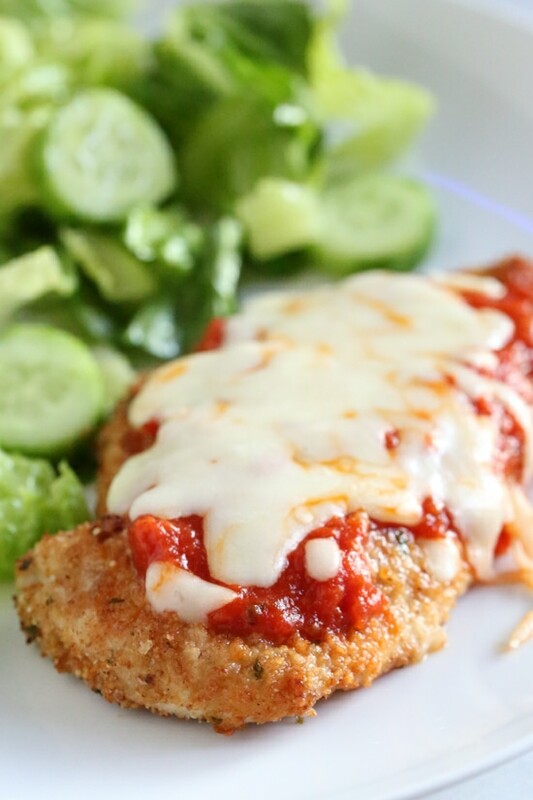 Can’t wait to try the Chicken Parmesan, thanks for posting! I have the copper 11×13 pan that can be used in the oven! Works great -wondering what I would need to do to make this?? Gina, the makers of these air dryers do not recommend spraying the basket…it surface. Any other suggestions? I have your chicken parm on my planner for the week…and I have an air fryer! Gonna try this! My basket is less basket and more “surface with holes” and it’s non-stick. But things still stick to it, especially breaded things like this chicken. I have found that spraying the basket surface leads to less sticking and crisper items too. I’m just sure to clean it really well afterward! I have read that spraying it with pure oil (and Pam now makes one that’s pure olive oil!) is better. Eventually the propellants will permanently stain the basket. By the way, I do it in the oven all the time. This is a family favorite at our house. Almost never leftovers even when I double the batch. 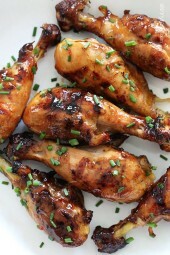 I absolutely want an air fryer! This just made me want one even more. This looks delicious! 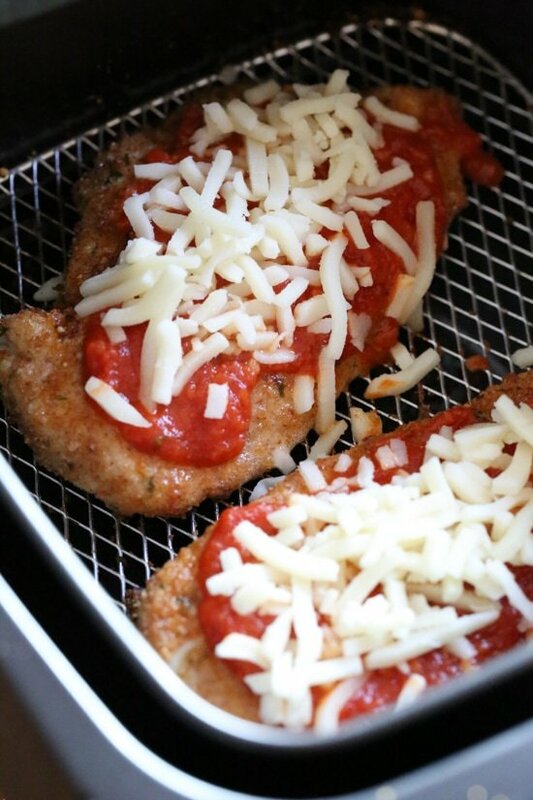 LOVE my air fryer and had already planned on making chicken parm in it tonight! It works really well, but you’re right, the only downside is the size of the basket. My son’s favorite dish is chicken parm and he doesn’t even notice that it’s not traditionally “fried” the way I used to make it. Yes! I just upgraded to the 6 quart. Hopefully 4 pieces will fit! I can usually only squeeze 3 in my 6 quart Nuwave. But it’s still so much bigger than the smaller version. Just ordered an air fryer this morning. I had vowed no more kitchen appliances but couldn’t I resist. I’m trying your pork chops this week and this will definitely be going on the menu!